Born in Ennis, Co. Clare in 1958, he studied at the National College of Art & Design and the University of Massachusetts from 1976 to 1981. In 1997, he received an M.A. in European Fine Art from the Winchester School of Art in Barcelona and Winchester. 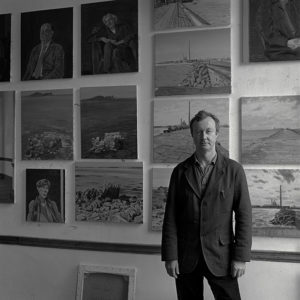 He taught at NCAD from 1981 to 1999, and has also taught at universities in England and the U.S. He has worked extensively with art and education programmes in prisons and rehabilitation centres, including Portlaoise Prison, St. Patrick’s Institution, Wheatfield Prison and Youthreach, Kilrush. In 2001, Plastic Warriors – a large collection of paintings and drawings of toy soldiers, made throughout the 1990s – was exhibited at the West Cork Arts Centre and at the Workhouse Museum at Donaghmore, Co. Laois. Also in 2001, the Royal Hibernian Academy exhibited a series of 40 formal, full-length portraits. The Kevin Kavanagh Gallery in Dublin exhibited a series of sea and beach landscapes from the Greek island of Skyros, in 2002. His awards include the Arnotts National Portrait Award (1985, 89, 93, 94), the KPMG Award in the Oireachtas exhibition (1992, 98), and the Taylor de Vere Award (1995).